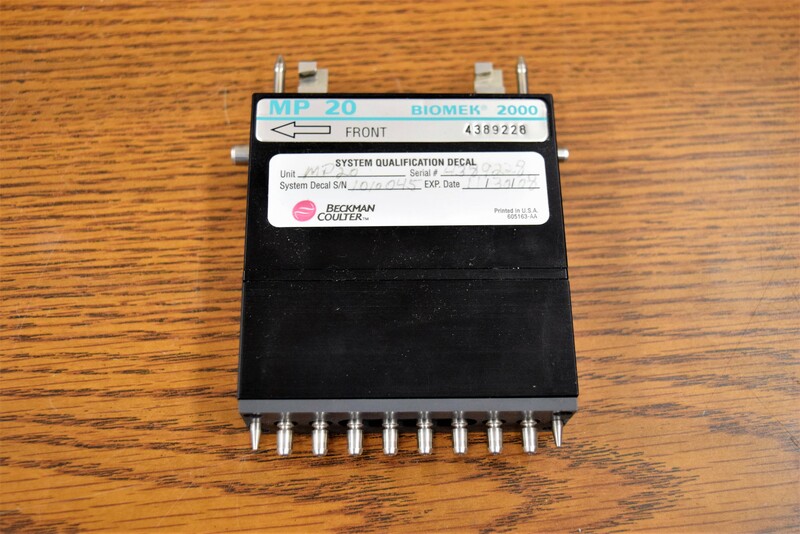 Beckman Coulter Biomek 2000 MP20 Eight Tip Pipette Liquid Handling uL-mL . New Life Scientific, Inc.
- Untested. This was removed from a liquid handler. This pipet is in good condition, it was removed from a liquid handling system that had errors communicating with the software. Although this instrument is untested, it is still protected by our 90-Day Warranty. Our in-house technicians did a visual inspection and it appears fit for application. It is marked expiration date 11-30-2008. Biomek 2000 multi-tip pipette tool accurately transfer volumes from 1.0 µl to 1.0 mL. All Biomek pipetting tools have liquid-level tracking capability that automatically calculates the sample height for subsequent liquid transfers after specifying the initial level. Multi-tip tools can reach to the bottom of Beckman Coulter Square-Well and Deep-Well titer plates or other multiwall labware up to 50 mm in length.